12 x 8 Stamped Steel Sidewall Register - White Discounts Apply ! 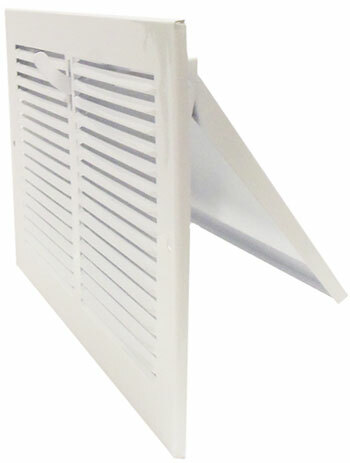 Try these sidewall registers today, these bright white metal diffuser are perfect for any project. These sidewall registers are affordable and look great. The white metal diffusers have a powder coated finish, which will compliment almost any decor. Sidewall diffusers are a breeze to install. They come ready to go with pre-drilled holes and screws. Furthermore, white metal diffusers have an easy to use single piece damper to control air flow. These sidewall registers are great for both heating and cooling systems. These white metal diffusers will fit a 12" x 8" hole. They have 1/3" spaced fins angled at 20° and a 3/16" margin turnback. These registers also have an all steel build, making them strong. - Outside dimensions of 13 1/4" x 9 1/4"
Sidewall registers available in additional sizes. Looking for matching white metal diffusers for baseboards? The industry standard is to measure by the size of the hole in your wall to ensure the perfect fit register. This stamped steel vent cover will fit a 12" x 8" hole, and the overall dimensions will be 13 1/4" x 9 1/4". Order your sidewall register today and see how great bright white metal diffusers can look!